Seven years in, it’s time to take stock of the Active History project. Since our founding symposium in 2008, Active History has branched off in a number of directions. Those include–but are not limited to–an annual lecture series (History Matters), a long-running podcast (History Slam), and a working group within the Canadian Historical Association. And then there is the website. Today, ActiveHistory.ca is home to well over 1,000 blog posts, papers, podcasts, and videos, and more and more people (between 20,000 – 25,000) are reading them every month. Not bad for a wordpress site run by a small group of volunteers. Most of all, these activities reflect the fact that Active History is comprised of a growing community of people who believe history should be collaborative, relevant, and accessible to a wide audience. Many are practicing that kind of history every day, as community members, scholars, heritage professionals, or teachers. From the start, the project has been as much about building and strengthening connections within that community as putting forward any particular vision of what Active History is, or could be. 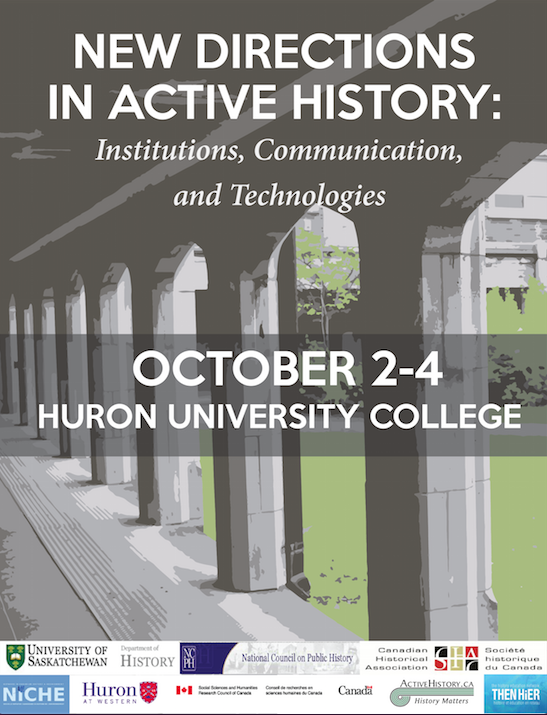 That’s the spirit behind the New Directions in Active History Conference, taking place next week (October 2-4) at Huron University College in London, ON. The term “active history” carries with it a diverse range of meanings. 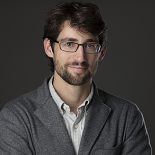 In different contexts, it can refer to: the broader public diffusion of historical knowledge; approaches to research that “share authority” with the communities being studied; a more focused use of historical knowledge as a tool of public policy and politics; or even open access forums like ActiveHistory.ca. These different meanings and emphases are linked by the idea that history can and should play a more constructive role in contemporary cultural and political life, and that historical knowledge should be much more than a tool of patriotism or the rote memorization of events, dates, and people. In this, it dovetails with recent discussions about the meaning and future of history, from Jocelyn Létourneau’s Passer à l’Avenir (2000), to John Tosh’s Why History Matters (2008) and most recently Jo Guldi and David Armitage’s The History Manifesto (2014). Reflecting these diverse definitions and foci, the conference is a chance for people doing active history–and sustaining Active History–to share their work with one another, and over the coming weeks and months with the whole community through ActiveHistory.ca. It’s been exciting to watch the conference program evolve and fill out over the past year, and to have a chance to embrace the heterogeneity of active history practices over the course of a weekend. Panels on teaching, museum practices and historical memory sit alongside workshops on podcasting and archival outreach; the poster session features activist historical comics, collaborative work on the First World War, and other innovative public history projects; and our keynote event takes history on stage with a series of research-based performances curated by David Dean, a professor in Carleton University’s Public History Program. This meeting is also an opportunity for the editorial collective to engage a wider group in thinking through the future of the project. The conference is structured to provide a continuous focus on the nature and practice of active history, and the purpose of Active History. On Sunday, October 4th we’re going to bring these conversations forward by hosting an end of conference discussion session built around a series of questions about the site and active history more generally. What is an active historian? What is active history to you? How could ActiveHistory.ca be a better support for others doing active history in different regions and/or communities? How can we make better use of the website and other open technologies? How do academic history programs across Canada encourage their students to engage in active history in their communities? What is the place of the active historian in shaping national narratives and historical memory? How do you envision yourself becoming/staying a part of the Active History project? These are big questions, but we hope productive ones. In framing Sunday’s discussion in this way, we hope that the conference will reflect our desire to expand involvement in the project. Since its inception, Active History has aspired to work as an open project, hosting mini-conferences, public lectures, and walking tours in addition to our work online. With the exception of Histoire Engagée, our allied francophone site, most of these initiatives, however, have taken place in southern Ontario, and Toronto in particular. We are particularly hoping to leave London this weekend with plans in place to diversify the project’s geographic focus and influence. We recognize, however, that early October is a busy time and that distance might preclude participation in this event. Although the conference will provide a more focused opportunity to discuss possible new directions for ActiveHistory.ca, on behalf of the editorial collective, we invite you to submit to our general e-mail account, info@activehistory.ca, suggestions and ideas for future projects or directions (in addition to blog posts and papers) and to follow the conference on Twitter using the hashtag: #ActiveHist2015. Over the coming months, we will be posting participants’ presentations, podcasts and videos of the conference. It is our hope that this conference will start a discussion that will continue for the weeks and months to come, on the site, on twitter (@ActiveHist), and in person. If you do find yourself in southwestern Ontario and looking for something to do this weekend, we encourage you to come down and join us. This entry was posted on September 28, 2015 by Daniel in Active History, conferences, public history and tagged Active History, conference.